Bare Bones Software, best known for its venerable text editor BBEdit ( ), has a reputation for making software that appeals to programmers and other technically inclined folks. But Yojimbo, now at version 1.5.1, is a solid play in the consumer software space. Yojimbo is essentially a digital junk drawer: a place for stashing the stuff you want to keep handy. If iPhoto ( ) is where you organize images and iTunes ( ) manages your music collection, Yojimbo aims to be the bucket where you keep everything that doesn’t fit cleanly into other organization tools. The product focuses on five primary kinds of information: text notes, bookmarks, Web archives, serial numbers, and passwords. In version 1.5, Bare Bones adds support for images and strengthens Spotlight support. Modeled on a storage metaphor similar to iTunes, Yojimbo is designed to let you drop items into its library, and then organize them into playlist-like collections. Bare Bones has devised an impressive array of ways to get information in. Most of these methods are designed to hand an item off to Yojimbo without bringing the application window to the front. The Drop Dock is a DragThing ( )-style panel tucked away at the side of the screen. Drag an item on to its tab and the panel slides out to reveal your collections. Drop a file on a collection and Yojimbo creates a new entry. It’s handy, but as my list of collections grew I wanted the ability to control which ones appeared on the panel. For data you can’t drag and drop, Yojimbo offers the Quick Input Panel. Summoned by a hot key, the Quick Input Panel is a small window docked in the upper right corner of the screen where you can create a new item manually or from the clipboard. For capturing URLs or Web archives, Yojimbo offers what it calls bookmarklets. Bookmarklets (a combination of bookmarks and applets) are bookmarks you can install (via drag and drop) in Safari or Firefox that, when clicked, create a bookmark or Web archive of the current browser page in Yojimbo. In my testing, bookmarklets installed and ran fine from Safari. Installing bookmarklets in FireFox 3.1.10 wasn't as smooth, but once there they functioned as intended. Yojimbo also accepts items via import, AppleScript, and a “Save PDF to Yojimbo” selection in Print dialogs; you can also simply create a new item from the application’s toolbar. For all the ways to get information into Yojimbo, options for organizing data once it's actually in the program are less abundant. Drawing from the iTunes approach, every item goes into the library. From there, you can create collections, which compare to iTunes playlists--any given item can appear in multiple collections, and you can remove an item from a collection without deleting it. Yojimbo does not provide a way to group collections into folders. That limitation puts an artificial ceiling on the number of collections one can reasonably manage. More than a few dozen means extra trips to the scroll bar. Yojimbo’s Drop Dock is one of many ways to get items into the library without having to switch to the application. A second way to categorize your information is to apply tags. Tags are words or short phrases you attach to items to convey some context. Enter a tag once and Yojimbo will remember it and offer to auto-complete it the next time you start typing that tag. This seemingly small touch makes tagging less onerous and more consistent. Regular tag users can make use of tag collections--dynamically updated collections akin to smart playlists. Yojimbo also offers 10 smart collections with fixed criteria like “untagged” or “flagged.” Tag collections are simple and reliable, but something more like smart playlists--with a variety of filters, like creation date and keyword--would be a whole lot more useful. 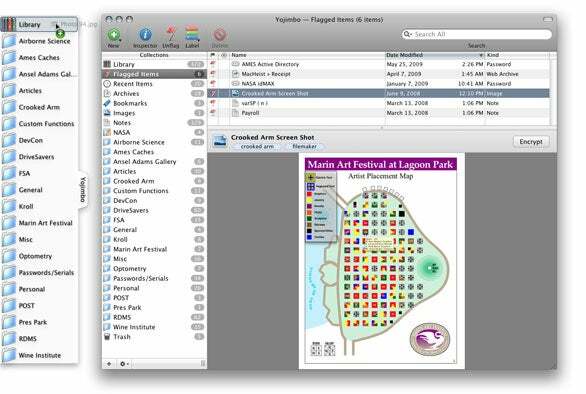 Colored labels, just like those available in the Finder, and a flag setting for marking items requiring attention round out the organization methods. Yojimbo is designed exclusively for the Mac and takes advantage of some of the benefits that the platform provides. The contents of Yojimbo’s database are indexed by Spotlight. This allows items stored in the program to be searched even when Yojimbo isn’t running. Data can also be synchronized with other computers using Apple’s MobileMe ( ) service (though the documentation still refers to the service by its former name, .Mac). Even if you’re not sharing Yojimbo items, MobileMe sync serves to automatically back up your data to an offsite location. Most item types can be encrypted once you’ve set a Yojimbo password. That one password is the key that unlocks any encrypted item, so a compromised password exposes all your encrypted data. On the other hand, Bare Bones uses AES-256 bit encryption, so as long as that password stays secure, your data is at very little risk. If people describe you with words like “meticulous” and “fastidious,” you may not need a junk drawer. For the rest of us, an uncluttered place to stash serial numbers, PDFs, bookmarks, and Web archives is a welcome tool. Yojimbo 1.5.1 ably fills this need with a minimum of fuss. I’d like to see some more advanced organizational tools, but that’s a minor criticism for an otherwise well-conceived and stable product.